Prepare thyself to eat at least two bowls of this goodness. With alllll the toppings. Remember that one time I told you about my dad, my dad’s white chicken chili, my dad’s plans to open a restaurant that serves hot dogs and chili, and the fact that my dad also has ah-mazing red chili that I wanted to share with you one day (like a year ago, oy)? OH YEAH. This is it, my friends. Dad’s (family-wide) famous, flavorful chili, loaded with chopped veggies, lean beef, red wine, tomatoes, chipotle chile pepper, beans and spices. You actually might want to start preparing a third bowl. My dad has been making a variation of this chili for for.ev.er, but only recently did he have the genius idea to add red wine, which I’ll explain more about in a sec. 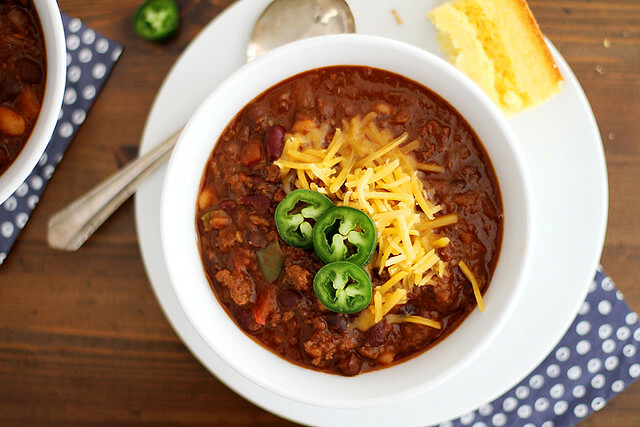 There have been a few other iterations of this chili (my dad likes — no, LOVES — experimenting in the kitchen) and that one time he accidentally poured in a heap of ground cinnamon instead of chili powder (but we’ll let that one go on here because my family doesn’t) but by and large, it is this recipe that gets him winning smiles all around. That’s hard to come by in my family, where one brother hates tomatoes and the other brother hates mushrooms and leftovers and my mom hates anything that tastes good like blue cheese and coconut and I don’t even know if those descriptions are attached to the right people, they all have so many strange distastes. Mine is only for oysters. And liver pate. But I feel like those are fairly more universal. ANYWAY, as I was saying — this chili. It’s so good. And it’s so easy, too! One of the reasons I don’t make chili all that often is because I’ve found that some recipes can be incredibly time-consuming what with all the chopping and such (basically I become this when I see all those ingredients/steps), but this one is very straightforward. And it’s all made in one pan, too, which equals less time doing dishes and more time eating chili. I LIKE. Oh yes, about that red wine — that’s a new addition to the recipe according to my dad, and so I was a little leery when he first told me to include it because I was all “but Dad I want the actual recipe, like the one that I stuff my face with every time you make it” and he was all “TRUST. The red wine is great.” And so I did. And it was great; like I-inhaled-it great. Though that’s really only a teensy step up from the normal speed at which I eat this chili. It just gives the chili an added depth of flavor that’s so rich and almost… I don’t know… I can’t even really describe it, except to direct your attention back up to the fact that I inhaled it. Does that clear things up? Also, a suggestion: As tasty as this recipe is on its own, it’s extra yummy with a boatload of toppings including, but not limited to: sour cream, CHEEEEESE, sliced jalapeno peppers, chopped cilantro, chopped green onions, crushed tortilla chips, crumbled cornbread and sliced avocado. Or spoon it on top of a baked potato. Or mix it with polenta and put an egg on it. I mean, there are just a gazillion ways to get this deliciousness in your face. I almost think I need a constant supply of this chili on hand all winter long just to make them all happen/survive the impending hermit phase. How about a fourth bowl? Too much? Then don’t ask me how many I had for dinner. In a large, heavy-bottomed saucepan or skillet over medium high heat, heat oil. Add onions and bell peppers. Saute 4 to 5 minutes until golden brown and softened. Add garlic; cook 1 minute. 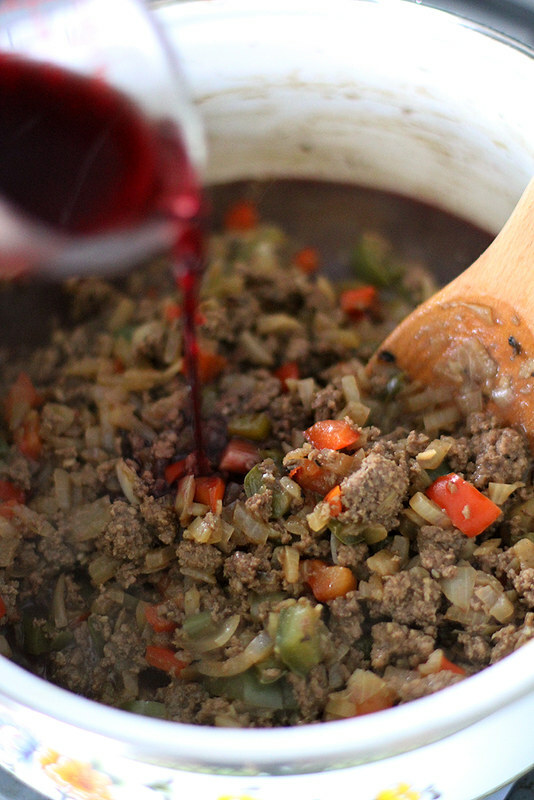 Add ground beef; break apart with a wooden spoon and cook 10 minutes until browned. Pour in red wine. Increase heat to high; boil 10 minutes, stirring often and scraping up any bits that stick to bottom of pan. Reduce heat to a simmer. 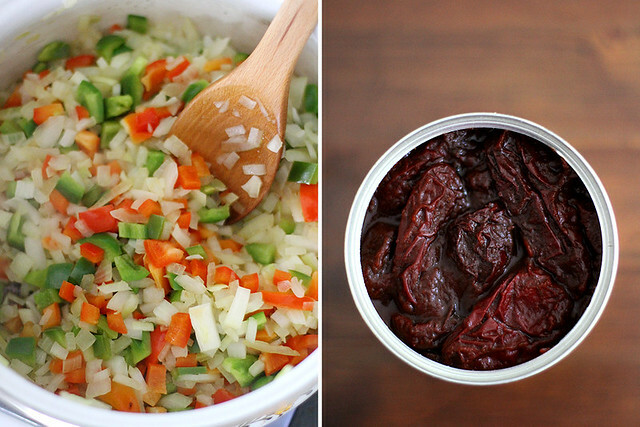 In a food processor or blender, puree crushed tomatoes and chipotle chile pepper until smooth. Add to pan along with beans (do not drain). Stir in chili powder, smoked paprika, cumin and salt and pepper to taste. 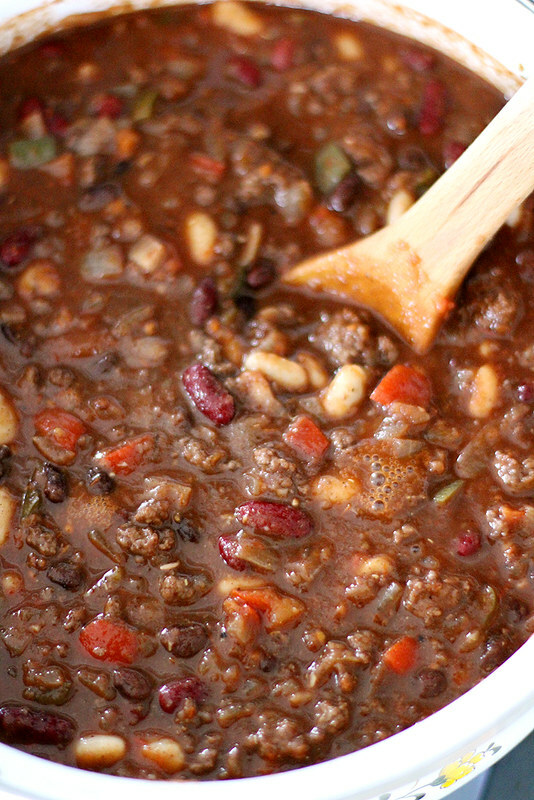 If chili is too thick, pour in some beef broth. Cover and simmer 1 hour, stirring occasionally. Adjust seasonings as needed, and add more beef broth to thin out as needed. Serve with your favorite toppings. Dad knows what’s up! How about a 5th bowl.. that looks so good. Family recipes are the best! I absolutely love the addition of red wine, and the best part about that??? You can have a glass while the chili bubbles on the stove. Yum! This looks like comfort at it’s best!! Papa GVD knows what he is doing!!!! I’m for reals 100% making a big batch of this over the weekend!!! Julia — YES YES AND YES. Potluck all the way. Make that five bowls please!!! Love the idea of the red wine in there, what a great depth of flavour it must add! This is the perfect kind of meal for a cold and wintery day and I’m super excited to cook up a batch over the holidays. Yum, that looks tastier than my chili recipe! If you like music, I suggest listening to Mumford & Sons while preparing and eating this. They go together perfectly! Love your dad’s chili!! Adding the red wine is genius! 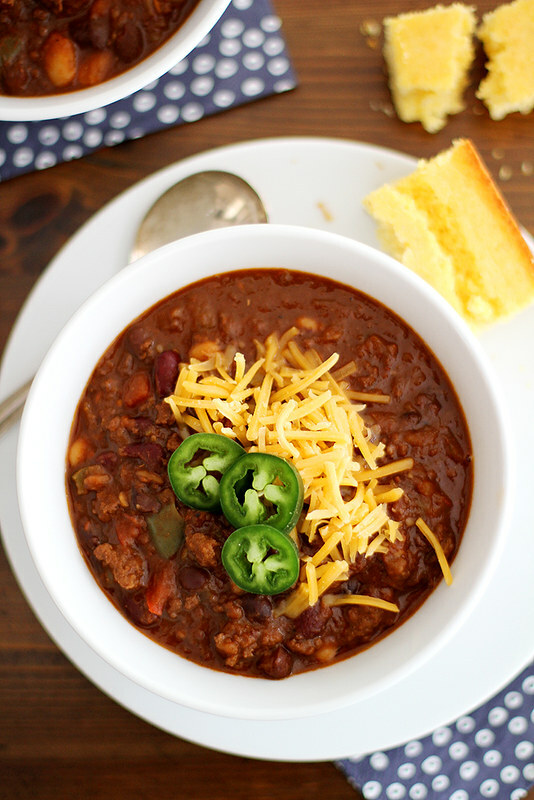 I’ve only added beer to chili but I have to try this, as I’m sure the Merlot deepens the flavors in the most awesome way. . and I feel like that cat AFTER I’ve consumed a big bowl of chili! 🙂 Happy holidays, Stephanie! Girl, your dad has chili SKILLZ. I think this chili restaurant dream of his should for sure become a reality. This chili looks amazing. Pinned! This recipe is rock solid! Just made it last night and oh weeee was it lip smacking good. Kudos to your pops for a hella good recipe. I’ve made chili with wine before but just guessed at what to do. I am making this with ingredients that I have in my cubboard & its quite close to your Dad’s receipe. I used tomato sauce, diced tomatoes, red kidney beans (I rinsed as I thought one had to), can of beans in Molasses (14oz), mixed beans & not drained. It is simmering on the stove so will know tomorrow how it turns out, lol!!! 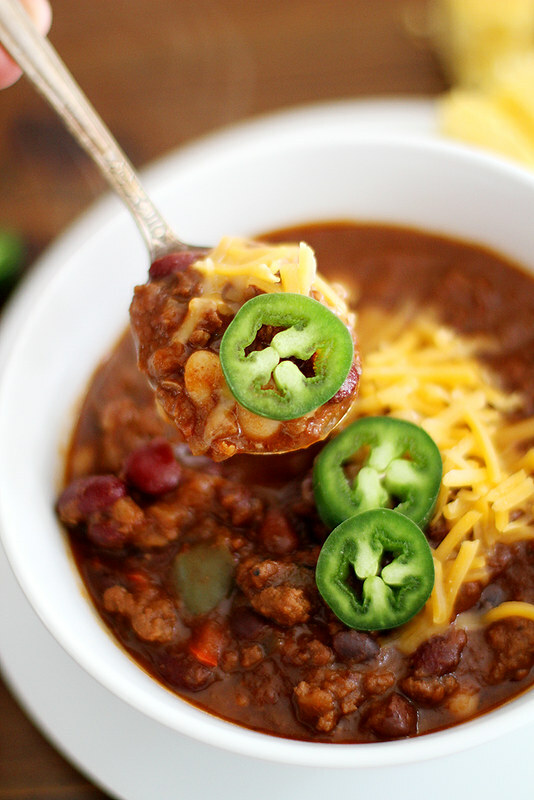 We made this chili last night, and it is SO GOOD! We only made a couple of changes/additions. We just finely chopped up the chipotle rather than blending it with the tomatoes, which worked great and meant one less thing to clean. We also used chicken chorizo instead of beef and added a few splashes of vinegar toward the end of the cooking time (I like a little tang in my chili). Other than that, we followed the recipe exactly and loved it! Will definitely be putting this in the fall/winter rotation. Thanks for sharing! Made this and it is Amazing! I’ve made Chili in general and left overs sit around until they end up in the garbage.BUT NOT “dad’s beef + red wine chili”!!! My husband was disappointed that my daughter and I ate the last of it. It is quite a bit of Chili and we finished it in two days. So Sweet of Your Dad to Share this Amazing Recipe, Thank You!